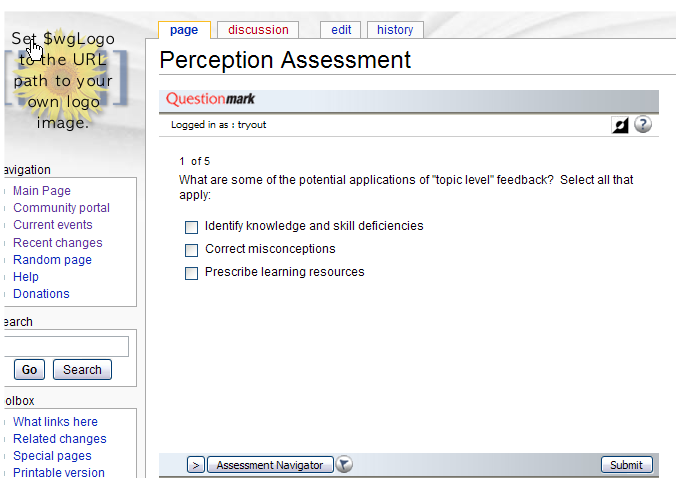 Embed a Questionmark Perception assessment, survey or quiz within a DotNetNuke portal. To see how this would look, see a snapshot of an assessment embedded within a web page using DotNetNuke. DotNetNuke an open source platform for building web sites based on Microsoft .NET technology. DotNetNuke’s content management system is extensible and customizable through the use of skins, modules, data providers, language packs and templates. 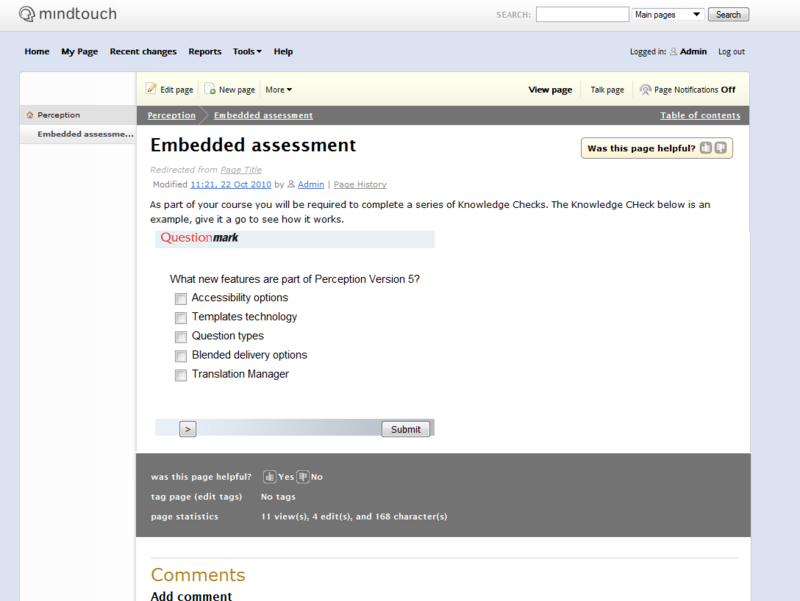 Embed a Questionmark Perception assessment, survey or quiz within an TikiWiki using an iFrame. To see how this would look, see a snapshot of an assessment embedded within a TikiWiki page. TikiWiki, also known as Tiki Wiki CMS Groupware, is a free and open-source, wiki-based content management system written primarily in PHP. In addition to enabling websites and portals on the internet, TikiWiki contains a number of unique collaboration features that allow it to operate as a Groupware web application. Embed a Questionmark Perception assessment, survey or quiz within an IBM WebSphere portal. 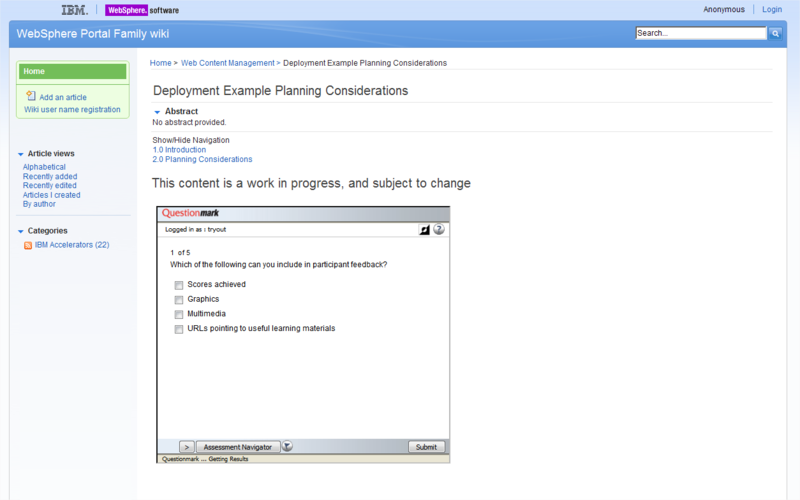 To see how this would look, see a snapshot of an assessment embedded within an IBM Websphere portal. IBM WebSphere Portal is a set of software tools enabling companies to build and manage Web portals. You can easily add iFrames to the IBM WebSphere portal using the Web Page Portlet, which enables users to view the content available at the specified Web addresses using inline frames.